Edward the Martyr was King of England from 975 until he was murdered in 978. Edward was the eldest son of King Edgar the Peaceful but was not his father's acknowledged heir. On Edgar's death, the leadership of England was contested, with some supporting Edward's claim to be king and others supporting his younger half-brother Æthelred the Unready, recognized as a legitimate son of Edgar. Edward was chosen as king and was crowned by his main clerical supporters, the archbishops Dunstan of Canterbury and Oswald of Worcester. Eadred was King of the English from 946 until his death. He was the son of Edward the Elder and his third wife Eadgifu of Kent, and a grandson of Alfred the Great. Eadred came to the throne following the assassination of his older brother, Edmund I. The chief achievement of his reign was to bring the Kingdom of Northumbria under total English control, which occurred with the defeat and expulsion of Eric Bloodaxe in 954. Eadred died at the age of 32 having never married, and was succeeded by his 15-year-old nephew, Eadwig. 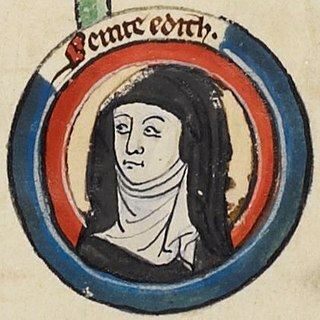 Saint Edith of Wilton was an English nun, a daughter of Edgar the Peaceful, king of England. She was born between 961 and 964 and died on 16 September in a year between 984 and 987. Following her death in 984, she became the patron saint of her community at Wilton Abbey in Wiltshire and churches were dedicated to her in Wiltshire and in other parts of Anglo-Saxon England. Her biography was written by Goscelin and her feast day is on 16 September. Æthelwald was ealdorman of East Anglia. He is mentioned in Byrhtferth's life of Oswald of Worcester along with other members of his family.